Red ants are not dangerous to people and domestic animals. However, the close proximity of these insects is unlikely to impress anyone. Due to its small size, fire ants are able to penetrate into the most unexpected places. If you do not take appropriate measures, you will soon be able to detect uninvited guests not only in the kitchen, but in his own bed. Liquid bait. Take 50 ml of water, 50 g sugar and 5 g of boric acid or borax. Add 1/2 teaspoon of jam or honey. Carefully stir the mixture, pour it on small saucers and set the saucer on the ant tracks. with jam or honey. Make balls from the mixture and place them in the path of the ants. This mixture is fatal to these insects. Dry bait. Mix equal parts sugar and boric acid and borax. Scatter the bait on the ant tracks. Liquid bait with glycerin. Mix 2 tablespoons sugar, 3 teaspoons honey, 1 teaspoon of boric acid or borax, 2 tablespoons of glycerin and 2 tablespoons of water. Heat the mixture over low heat, stirring constantly. Achieve complete dissolution of all components. Note that the amount of borax or boric acid in these recipes is not recommended to increase because the recipe is designed so that worker ants have time to carry the poisoned food to their nest. Find the ant nest - not an easy task, as the ants are very small in size they can arrange their home in a very remote place. To find the nest, try to follow the movement of red ants. If you are able to find their home and destroy the ant Queen is you are guaranteed to get rid of the intruders. Looking for the nest, it is recommended to keep the spray can with "Dichlorvos" or any other similar tool. Keep your house clean, especially the kitchen and dining areas. Carefully wipe all the crumbs and food debris. Ensure that the sink does not remain drops of water. Remove all products in sealed cans. Lubricate the edges of the plastic packages in which food is stored, sunflower oil - its scent repels ants. 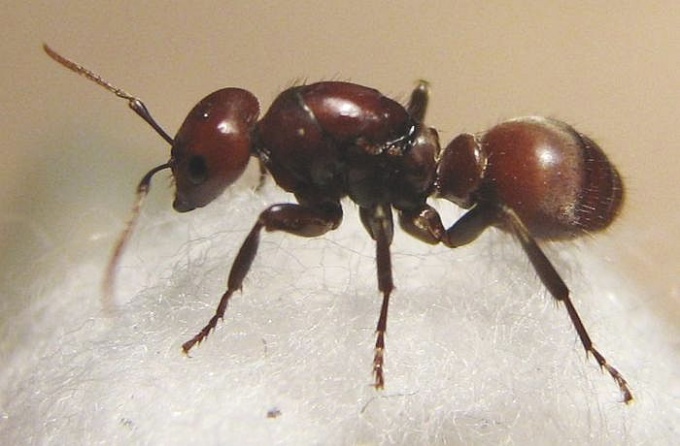 Device for toxic baits for red ants need to exercise discretion and accuracy. Never place bait in areas accessible to children and Pets. Bait with the use of boric acid and borax can lead to severe poisoning up to lethal outcome.